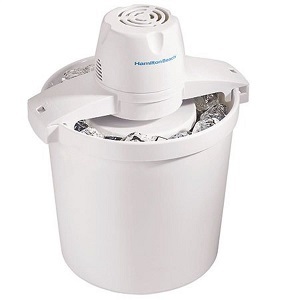 Looking for How to make homemade icecream with any type of icecream maker in 2019? Scroll down this page and follow the links. And if you bring home some fruit or vegetables and want to can, freeze, make jam, salsa or pickles, see this page for simple, reliable, illustrated canning, freezing or preserving directions. There are plenty of other related resources, click on the resources dropdown above. You can make any type of homemade ice cream - easily! Vanilla, chocolate, strawberry, any type of fruit, or even mixed flavors or exotics, like butter pecan. You just need to fruit, nuts or flavorings. And if your diet demands it, you can make regular or lowfat, or sugarless! All variants are show below! There are two types of ice cream makers (for home use); those that use ice and salt; and those that have a gel container that you pre-freeze in your freezer. Now, even if you've lost your ice cream maker's manual, directions or instructions, don't worry; these recipes an d their directions will work with any ice cream maker, and will explain in detail how to do it. Others - Coffee, Gelato, Sorbet, Frozen Yoghurt, etc. If you've lost your ice cream maker's manual, we may have a copy on the page below - which you can download for free. And if it is time to replace your ice cream maker; we've got some recommendations to get the best for your money!